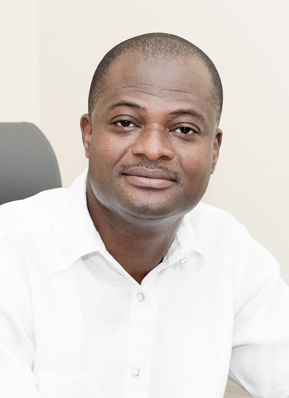 Raymond Akongburo ATUGUBA is Associate Professor of Law at the University of Ghana School of Law, where he has taught since 2002. After his first law degree from the University of Ghana (1997) and his call to the Ghana Bar (1999), he received both his Master of Laws (LL.M) and Doctor of Juridical Sciences (SJD) Degrees from Harvard Law School in 2000 and 2004. He has been a Visiting Scholar and Visiting Professor at University of Nottingham in the UK, Harvard in the USA, Ku Leuven University in Belgium, Université Sciences Po in France, and Monash University, Australia. During other of his sabbatical leaves, he served as the Executive Secretary to the President of the Republic of Ghana (2013 to 2015), working directly with the President to provide policy anchorage between the Executive Presidency and about a thousand public service agencies. Before this, he worked as the Executive Secretary and Principal Researcher to the Constitution Review Commission (2010-2012), set up to undertake a consultative review of Ghana’s 1992 constitution. Prof. Atuguba is also Co-Founder and former Executive Director of the non-profit institution, Legal Resources Centre, and the Founder and Team Leader of Law and Development Associates (LADA), a law and consultancy firm. Over the years, and in the context of his work with these institutions, he has championed the development and application of innovative and creative ideas, solutions, and facilitation techniques for the resolution of some of the most intractable problems of African Polities. He has consulted widely for various international organisations and national institutions, including the governments of Liberia and Ghana and several of their Ministries of State. He has also consulted for the United Nations, the World Bank, the European Union, the African Union, the International Labour Organisation (ILO), the United Nations Development Programme (UNDP), the United Nations Office on Drugs and Crime (UNODC), the United Nations International Children’s Education Fund (UNICEF), the United Nations High Commission for Refugees (UNHCR), the International Organisation for Migration (IOM), the United States Agency for International Development (USAID), the United Kingdom’s Department for International Development (DFID), the Economic Community of West African States (ECOWAS), the British Council, Action Aid International, Plan International, Oxfam and several other intergovernmental bodies, and international and local development agencies and non-profits. Prof. Atuguba has researched and published extensively, mostly in relation to the intersection of law, human rights, policy, governance, the politics and economics of development, institutions and institutional change. He has written over 100 monographs, articles, book chapters, research reports and technical papers on issues of Public Policy, Constitutionalism, Human Rights, Law and Development, and Institutional Renewal in Africa. He has also presented over 200 papers on these subjects at national and international conferences in all continents of the world, including expert papers to the leadership of Parliament and to Parliamentary Committees in Africa, and facilitated dozens of training workshops.